Christopher Luxon launches Air New Zealand’s ‘sustainability framework’. 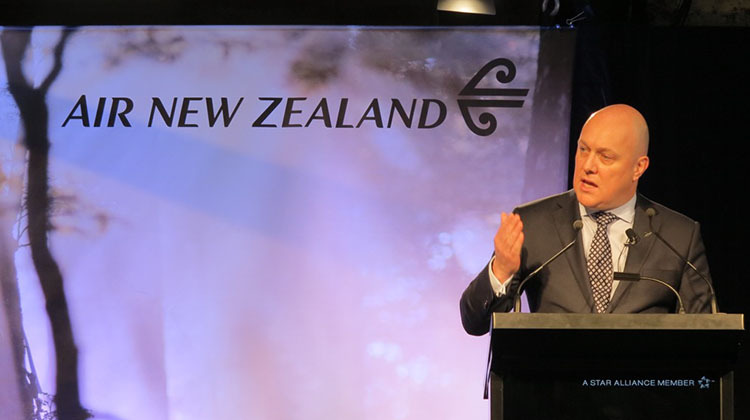 Air New Zealand chief executive Christopher Luxon says that putting environmental, social and economic sustainability at the heart of his airline’s operations is part of the company’s drive to become a “world-class” organisation. “The bottom line is, getting out of the world of aviation, the very best companies in the world, that are, frankly, doing really well commercially, have their heads sorted on this stuff,” Luxon told journalists after the launch of his airline’s ‘sustainability framework’ in Auckland on Wednesday. The sustainability framework – launched at a breakfast event in Auckland attended by New Zealand business and political leaders, environmentalists and social entrepreneurs – sees Air New Zealand commit to increasing its environmental as well as social and economic sustainability through a range of measures from carbon offset programs to recycling to providing funding for environmental research. The airline’s sustainability initiatives will be guided by a “Sustainability Advisory Panel” comprising six independent experts – leading environmentalist, Sir Jonathon Porritt, co-founder and director of the UK-based Forum for the Future; University of Auckland academic and writer Dame Anne Salmond; New Zealand entrepreneur and conservationist Rob Fenwick; social entrepreneur Derek Handley; US biofuels expert Suzanne Hunt; and International Air Transport Association (IATA) chief economist Brian Pearce – as well as Luxon and Air New Zealand’s chief flight operations and safety officer, Captain David Morgan. The airline will also publish annual sustainability reports, the first of which was launched at the Wednesday event (and can be downloaded here), and has reaffirmed its commitment to IATA’s voluntary sustainability targets, most notably carbon free growth by 2020 (ie offsetting the increase from carbon emissions from growth from 2020 onwards). While the sustainability framework has a much broader focus than carbon emissions, moves around the world to price carbon – New Zealand already has an emissions trading scheme for domestic carbon emissions – means “future-proofing” the business to be ready for a price on carbon emissions is a central consideration. 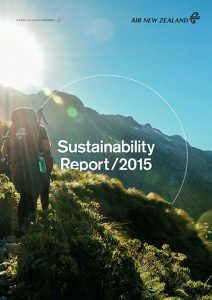 In the nearer-term Air New Zealand announced several initiatives on Wednesday as part of its sustainability framework launch including a new supplier code of conduct to ensure the airline’s suppliers meet support its sustainability goals, transitioning, “where feasible”, the airline’s fleet of road vehicles and ground support equipment to electric power, and a uniform recycling program. The New Zealand flag carrier also announced it has signed on as a participant of the UN Global Compact; that it is setting up an annual speakers series to bring international “thought leaders” on social development, business growth and environmental issues to New Zealand; and that it is extending support and sponsorship arrangements with the NZ Department of Conservation and Antarctica New Zealand and the New Zealand Antarctic Research Institute. Longer-term, meeting the carbon free growth goal is a “stretch target”, concedes Luxon. 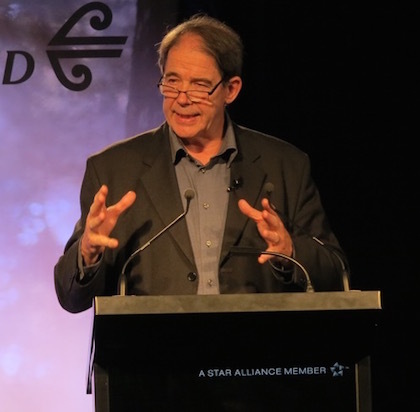 Sir Jonathon Porritt speaks at the launch of Air New Zealand’s ‘sustainability framework’. “We’ve got to try and find our way through the solutions for that but we think we can. It’s a great challenge yet they are the goals that we signed up for … and we really want to make sure we deliver them and we can model out there that an airline can actually do that because I think there is still some skepticism from airlines around the world that believe that really when push comes to shove will you actually be able to deliver it on the timescale, and we want to demonstrate that.